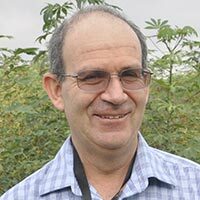 Peter Kulakow is a Cassava Breeder / Geneticist. Peter, a US citizen, obtained his BSc and PhD degress, both in Genetics, from the University of California, Davis in 1981 and 1986, respectively. Prior to joining IITA, He was a environmental consultant and research assistant professor in Agronomy with the Kansas State University in Manhattan, Kansas from 2000 to 2008. He has extensive postgraduate experience in plant breeding, environmental science, and project management including eight years with the Land Institute in Salina, Kansas and 13 years with Kansas State University. He has also worked as a consultant in Landscape Ecology with the University of Nebraska in Lincoln; as an instructor in Environmental Engineering Technology with Kansas State University; and as a research assistant at the University of California, Davis.